Behavioural insights can help policy makers obtain a deeper understanding of the behavioural mechanisms contributing to environmental problems, and design and implement more effective policy interventions. This report reviews recent developments in the application of behavioural insights to encourage more sustainable consumption, investment and compliance decisions by individuals and firms. Drawing on interventions initiated by ministries and agencies responsible for environment and energy, as well as cross-government behavioural insights teams, it portrays how behavioural sciences have been integrated into the policy-making process. The report covers a variety of policy areas: energy, water and food consumption, transport and car choice, waste management and resource efficiency, compliance with environmental regulation and participation in voluntary schemes. It shows what has proven to work – and what has not – in policy practice in OECD countries and beyond. How can behavioural insights help tackle environmental problems? How have behavioural insights been used by governments to tackle environmental problems and which behavioural interventions have been shown to work in practice? Watch the video - On 17 May, Elisabetta Cornago of the OECD Environment Directorate discussed how governments have leveraged behavioural insights to encourage more sustainable consumption, investment and compliance decisions by individuals and firms. The presentation is based on the OECD report Tackling Environmental Problems with the Help of Behavioural Insights published on 10 May. 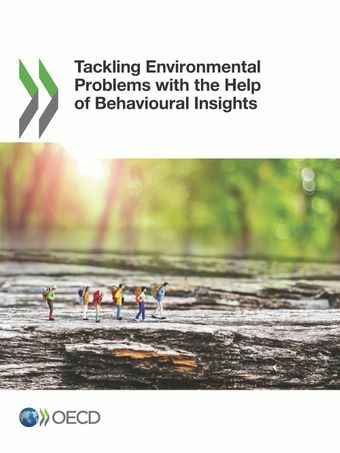 The report shows that insights from the behavioural sciences – behavioural insights – can help policy makers obtain a deeper understanding of the behavioural mechanisms that contribute to environmental problems, and design and implement more effective policy interventions.